Papermouth vs. Largemouth – I met up with my friend, Jim Junk, on this trip and we shared the boat from 2:15pm-5:00pm. 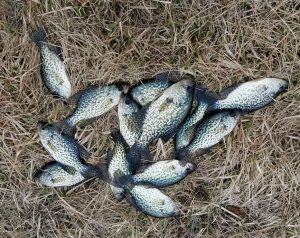 Before and after that time frame, Jim managed to land a nice mess of crappies, two shy of a 15 fish limit only because he tossed a few 9” fish back along the way. 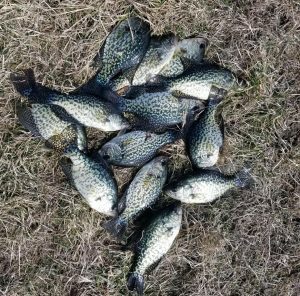 He repeated his crappie catching ways the following day with a haul that included a real nice 13” catch. 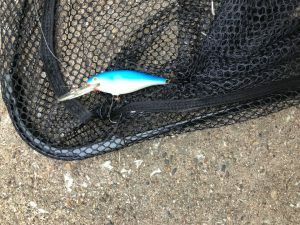 One That Got Away – Yep, had one of those this time around. Jim hooked into a decent bass with a jig while fishing some brush along the edge of a trough in a shallow pocket. Most of the pocket is about 2’ deep with the trough dipping to maybe 4’. Unfortunately, I did not have the boat positioned particularly well and his catch made a run under a laydown and came unhooked. Not sure on an estimate but made a good bend in the pole and a strong run before getting away. 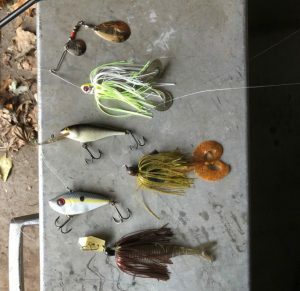 Starting Lineup – I had most of my standard early season cold water arsenal tied on and truly expected the jig or Shad Rap to be the winners. Turned out that the spinnerbait got my lone bass which was encouraging as I was retrieving at a fairly moderate speed. The fish was in about 3’ of water which also had my hopes high for finding some more interested in the presentation. Wasn’t meant to be so stuck on one bass for 2019. Did have one other strike on the spinnerbait and failed on two bumps on a jig and craw, rusty after that winter I guess. Theme Song – I have tunes running through my head every day and I generally find some apt lyrics on replay in my mind on fishing trips. They just seem to appear as kind of a summary of the day chasing bass. On this occasion it was a bit of Pink Floyd in the form of “I have become comfortably numb.” While the weather app said it was between 52 and 54F, a decent breeze and cloud cover made for several fingers that I couldn’t feel by the time I decided to head for home. Regardless of numbers, I had a good time on the water with a fellow angler and longtime friend. My odds of getting back out in March are slim and will stay tuned to see how things pan out for Jim. I do have April 1 marked on the fishing calendar with a vacation day from work and some walk-in bass fishing on the agenda. We’ll see how that works out after losing 20 pounds last fall. Found 16 of them back this winter though. Man, winter ain’t good for nothing.